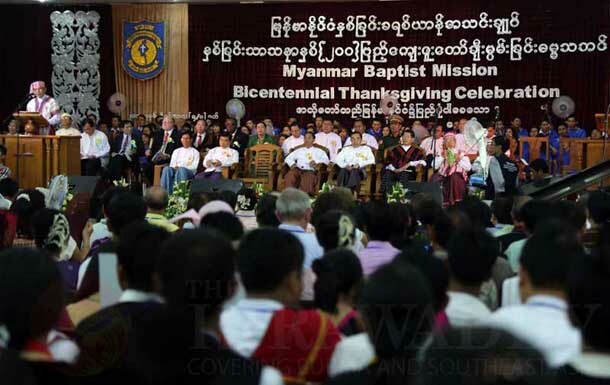 RANGOON — Tens of thousands of Burmese Baptists are celebrating the 200-year anniversary of the arrival of an American missionary who is credited with translating the first Burmese-language Bible and bringing Baptist Christianity to the country. A four-day commemoration began on Thursday in Rangoon to commemorate the arrival of Adoniram Judson, a Massachusetts native who also compiled the first Burmese grammar book and the first English-Burmese dictionary, in addition to introducing the printing press to the Buddhist-majority Southeast Asian country. The celebration in Rangoon is the first mass gathering of Baptists in Burma, where gatherings of more than five people were forbidden during decades of military rule. Over 25,000 people registered to attend the commemoration, said the Rev. Samson, secretary of the committee for the Bicentennial Baptist Mission. Tens of thousands of visitors wearing ethnic attire poured into the Alone Poe Karen Baptist Church compound, where the ceremony was held. Also in attendance were government officials, including Rangoon Division’s chief minister, Myint Swe, together with ethnic Karen parliamentarians. The four-day celebration will include a praise and worship program at the Alone Poe Karen Baptist Church compound and the Myanmar Baptist Convention compound, also in Rangoon. Historical photos will also be on display in an exhibition. Ethnic Baptists from Kachin, Karenni, Karen, Chin, Mon, Arakan and Shan states attended the opening ceremony in traditional dress. Dancers from each ethnic group were also set to perform traditional songs and dances on Thursday evening. “I’m very thankful to God that I have a chance to participate in this centennial celebration. I will perform my best to show gratitude for the Rev. Judson and the grace of God,” said Arze Mee, a 24-year-old from the Akha ethnic dance troop. Judson and his family came to Burma via India’s Chennai, hoping to spread the Baptist faith. When he arrived in the early 1800s Burma was ruled by Burmese King Bodawphaya and facing conflicts with British colonial troops. Along with his wife, Judson spent more than three years studying Burmese language as he attempted to start a mission in the country. He compiled the first Burmese grammar book, and in 1817 he translated the Gospel of Matthew from the New Testament into Burmese. In 1819 a Burmese man was baptized for the first time. A bitter relationship between the British and the Burmese king affected Judson’s ambitions to continue spreading his faith. The king and his officials assumed Judson was an English spy, and in 1824 when the first Anglo-Burmese War broke out, Judson and other English men were imprisoned. One year later he was freed. He served as an interpreter while the British and the Burmese king worked to sign a treaty. In 1826 the English-to-Burmese dictionary compiled by Judson was printed and distributed by the Calcutta Baptist Mission of India. Christians make up about 4 percent of the population in Burma, while about 90 percent of people are Buddhist.